BOOM, CRACK, RATTLE, That is the sound an earthquake would make… pretty scary right. Earthquakes come in many sizes and different speeds and power, but wait let me tell you what an earthquake even is. An Earthquake is the shaking of the ground, when energy in rocks is released. An earthquake has an epicenter and a focus, the focus is the breakage underneath the earths surface. The epicenter is right over top of the focus but above the surface. Most earthquakes are beneath the ocean floor, most earthquakes have a magnitude of 4 or lower. But wait, how does an earthquake start? Or what makes it go or stop? Can we do anything to stop them? 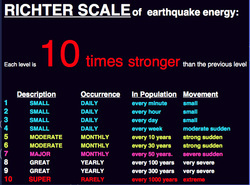 What's a richter scale? Well its only what the use to measure the power of an earthquake. But it's not the only one thing that measures it there is also a seismograph. Seismograph are how they measure earthquakes. 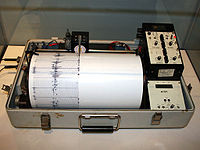 A seismograph is a tool that is used to pick up earthquake movement. For it to work it has to be attached to the solid rock underneath the soil. It can track where the epicenter and focus are. But it cannot pick up earthquake signals from to different sides of the word. For example, If the seismograph was on one side of the world, and the seismograph had to read something that has gone through the outer core, it wouldn't be able to pick up the waves. Why can't it? That is because there are shadow zones in the outer core, which the waves cant go through so the seismograph wouldn't be able to pick up the signal. A richter scale is used to measure the strength of the earthquake, as in if it is an 8.9 magnitude earthquake. They get that information from the richter scale. The amount of energy released increases the strength of the earthquake. A magnitude of an earthquake of 2 is very hard to measure, because it is barely even notice able. But an earthquake with the magnitude of 5 can be picked up easily, and can cause damage. But, a magnitude of 7.0 or 8.0 can be a catastrophe, because it is so much power it could break roads, buildings and more! A normal fault line occurs at a divergent boundary, what happens is one plate slides down. They are normally found in places where the lithosphere is stretched or at the edge of huge slumps and slides. As one slides down they are actually moving apart from each other like in a divergent boundary. 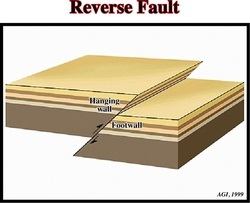 A reverse fault like occurs at a convergent boundary, one plate overlaps the other. But as they overlap one is being pushed up so that they are over lapping. But they are also being pushed together, that is why there is so much tension and why one is gong up instead of down. A strike slip fault line occurs at a transform boundary, one plate gets stuck on the other, energy builds and then the rocks beneath it break and create an earthquake. It is the crust that is moving past each other and builds up the energy of power to make them snap in the end of the tension. 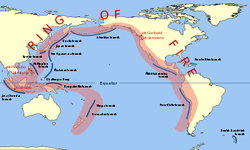 The ring of fire is an area where there are a ring of volcanoes. Where many earthquakes happen and volcanoes erupt. They are in the pacific ocean and make a horse shoe shape. There are 452 volcanoes and is where about 75% of the worlds active and dormant volcanoes are.